The Buffett Rule is back in the news. The Senate Democrats have included it as a part of their solution to avoid the sequester, which is slated to take effect on March 1st. A recent Tax Foundation study found that trading spending cuts for tax increases is typically not a good formula for economic growth, but that’s not the only reason the Buffett Rule is poor policy. First, some background: The Buffett Rule was first proposed by President Obama in 2011 in response to the claim by billionaire Warren Buffett that he pays a lower tax rate than his secretary. The rule is a tax designed to place an effective tax rate of 30 percent on high earners, phasing in between $1 million and $2 million. Although the Senate has yet to release the official language for the recent iteration of the Buffett Rule, the proposal would probably be similar to the one that failed in the Senate last April. The rule itself would have little budgetary impact, raising a meager $47 billion over ten years according to the Joint Committee on Taxation. The roughly $5 billion in annual revenue would cut last year’s $1.1 trillion deficit by less than half of 1 percent. Instead, the push follows a narrative of fairness, citing the need for the wealthy to pay higher tax rates than the middle class. But this is already the case. The U.S. currently has the most progressive income tax system according to the OECD. 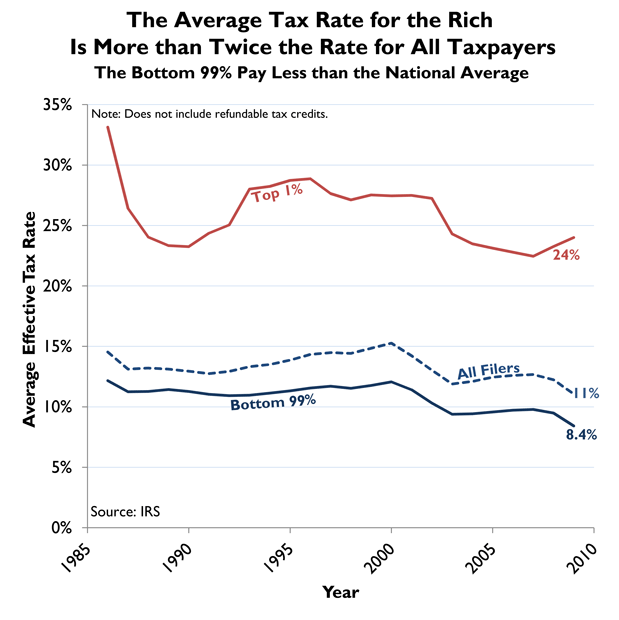 IRS data show the average tax rate for the top 1 percent is 24 percent and the average tax rate for the bottom 99 percent is 8.4 percent. The low rates we sometimes see from wealthy individuals is because they derive much of their income from investments, which is double taxed anyway. A capital gain or dividend is first taxed at the corporate level, as a corporate profit, then at the shareholder level. The result is a combined average tax rate of 56.7 percent in the United States – higher than every developed country in the world except, France, Denmark, and Italy. This creates a huge disincentive to invest, ultimately slowing economic growth. Investment, and through it economic growth, is not something that only benefits the wealthy – it impacts us all. Higher capital investment leads to greater productivity, which leads to higher wages and better living conditions for workers across the income spectrum. Warren Buffett has made his fortune, and good for him. But his political musings if made law would further stagnate the U.S. economy and prevent millions of Americans from achieving a higher standard of living. For more of our work on the Buffett Rule, click here, here, here, and here.